When I talked to my mom about her life choices, I started reflecting on the “American Dream,” especially the part that says each generation should “do better” than the last. The idea that everyone has a right to pursue her dreams and goals and can achieve them if she works hard–well, that sounds great. But the American Dream is often defined in material terms: “better” means bigger house, bigger car, more education, more monetary wealth. This is an expectation that weighs heavily on the American psyche, for individuals and the society as a whole. We feel pressure to go to college, and increasingly, graduate school (hence a lack of trades professionals and huge student debts). We feel pressure to acquire and display as much as those around us (hence astronomical levels of personal debt). We feel judged for making out-of-the-box, less lucrative decisions (like being a stay at home mom). When you take a generational view, though, this is impossible. Where is the ceiling? When are we satisfied by how much we have? The expectation that we keep getting more is an unsustainable model in terms of both happiness and material reality. The American Dream, so defined, is a myth. And the focus on material gain has set off an environmental and economic implosion. We need an attitude adjustment. We need to prioritize our deeper happiness over material wealth, and allow a long-term view in this respect to shape our short-term decisions. Studies show that there is a limit to how much happiness money can “buy”–generally just beyond the point where a person can comfortably cover his living expenses. It’s not money, but things like relationships and how you spend your time that drives life satisfaction. I’m sorry to get so serious, but I see my decision to pursue a new model for myself as reflective of a greater trend in society. I’m not alone among my friends in wanting to change my life along these lines. My readers give me further proof that this isn’t just some personal whim. Maybe this itch is part of our survival mechanism kicking in, an innate recognition that our race won’t make it if we keep going along this path. Is this why my generation is having so much trouble defining itself or being defined? Have we hit a wall? Is it time to redefine success, re-imagine our dreams? By leaving a traditional career behind and instead pursuing income from interests and activities that are more satisfying, I might be turning away from a bigger salary and/or career prestige. 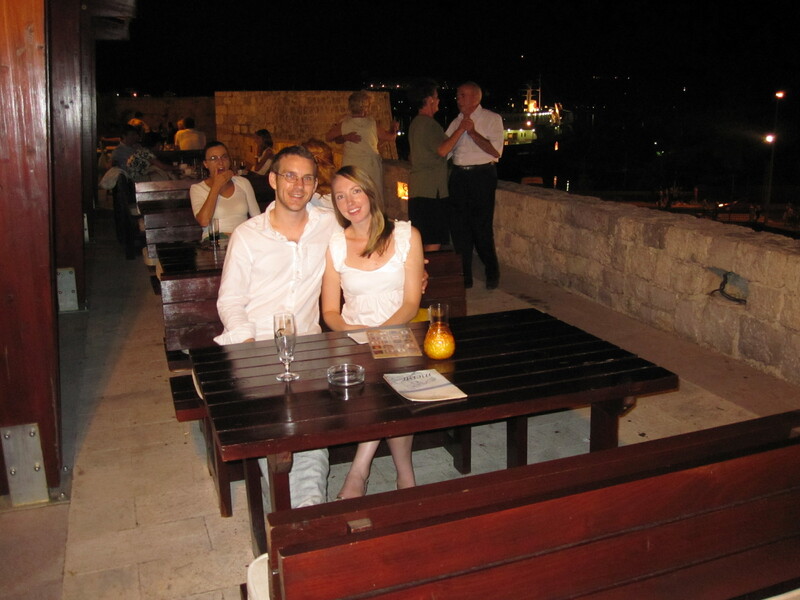 …then I think we’ll be ok.
Mike and I, quite satisfied after dinner in Kotor, Montenegro on our honeymoon. All true. I am now living on less than a third of my former staff newspaper income from 2006 when I was summarily canned, two weeks after my front-page story ran. Whatever. When your income drops like a stone, you can: freak out — or live on less and like it. I’m older (54) and am fortunate enough to have acquired many of the material items that make our daily life pleasant and lovely, whether a duvet cover or pretty dishes. But we live, and have for 22 years, in a one-bedroom apartment where I work at home; drive a 10 year old car and for years, when things are really tight, bought many of my clothes and shoes at consignment shops, allowing me to enjoy excellent quality for lower prices. It still satisfied me: nice things without killing myself to make the money for the “real” thing. I live near NYC and you want peer pressure?! Most of my neighbors drive shiny new cars and live in huge houses and make sure their kids attend Ivy schools. Ugh. I would rather, as we do, live a less frenzied and materialistic life, save $$ for retirement, travel when we can, and not make some insane effort to impress people with..stuff. A life well lived, for me, is healthy, fun, filled with friendship and work I enjoy. Such a great philosophy! I find the lifestyle seems to shrink or expand to fit the budget and things that seemed so important can become much less so when you can’t afford them, if you are willing to prioritize and be realistic. We are about to downsize from a house to an apartment and I am looking forward to the challenge (and getting rid of some stuff)! Thanks for sharing your experience! I’m Canadian and I still have yet to figure out the Canadian dream (although it seems pretty similar to the American dream)!…However, as you point out our generation (generation x and y) are starting to diverge from it with good reason too, b/c the dream is a big myth…..It doesn’t really make you happy. You may be happy with all the stuff you can buy and the kudos you will get from other people for your success, but these things are fleeting. Real happiness comes form being able to spend time with your friends and family (things that some people can’t afford to do b/c they are working non-stop and are forever connected to their work)! Thanks! Kudos to you on your thriftiness. It is a bit of a challenge/game, isn’t it?! Sorry to burst your bubble, but my next post will discuss how Mike and I painstakingly saved up for our sweet TV, so no, you cannot have it. And you’re always welcome to visit, even if pilfering isn’t involved! Very thoughtful post and video. The video was simple and to the point. Reminded me of the common craft videos regarding media and technology…good messages…refreshing with no frills…in fact the lack of frills make them charming, engaging and did I say simple, already? I am glad this is on your blog so I can go back and reread. This is one folks need to link back to. Keep the dialogue going, self styled lady. My 4th of July post will be about a sailboat mast turned flagpole…I am thinking now how to logically link back…may I link back to you? Thanks, Georgette! Yeah, my sister Kirby had shown me “the Story of Stuff” some years ago and it stuck with me. Very well done! You are most certainly welcome to link back to any of my posts! Great post! Very inspiring and has certainly given me food for thought. You don’t need to apologise for writing more serious posts, they’re still easy to read, interesting and you should share these thoughts 🙂 Looking forward to hearing about you and your husband’s journey off the beaten track.